Meyer Nite Saber 2 Plow Light Kit DOES NOT include Modules. 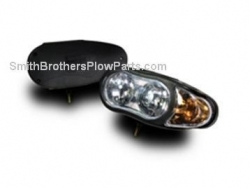 Meyer Nite Saber 2 Plow Light Kit ***OBSOLETE**** Please order Nite Saber 3 light kit.This item is NOT FREE. *** OBSOLETE**** NOT FREE*** Meyer Nite Saber Plow Light kit #07234. Old part# 07223. Replaced by Nite Saber III 2018.